Was your commercial roof damaged by a tornado or hurricane? Even smaller storms can wreak havoc on your roof, tearing seams, removing ballast, puncturing membranes, and leaving debris littering your roof. Whether you need a few small repairs or a whole new roof system, make R.B.T Construction Roofing Division your first choice for storm damage roof repair in Texarkana, TX as well as the entire United States! Reach us at 903-691-0931. If your roof has sustained damage in a storm, it is essential to have it repaired as quickly as possible. Moisture can quickly seep through torn seams and cracks, causing extensive damage to your roof system. Our roofers will carefully assess your property and let you know your best course of action. We will also do everything we can to prevent further damage while keeping our crew safe. Even minor damage should be repaired quickly to prevent further damage. Living near the Gulf Coast and Tornado Alley, our roofers have seen plenty of roofs with storm damage. Our experienced crew stays busy throughout the year repairing roofs from New Orleans to Tulsa to Little Rock to San Antonio. 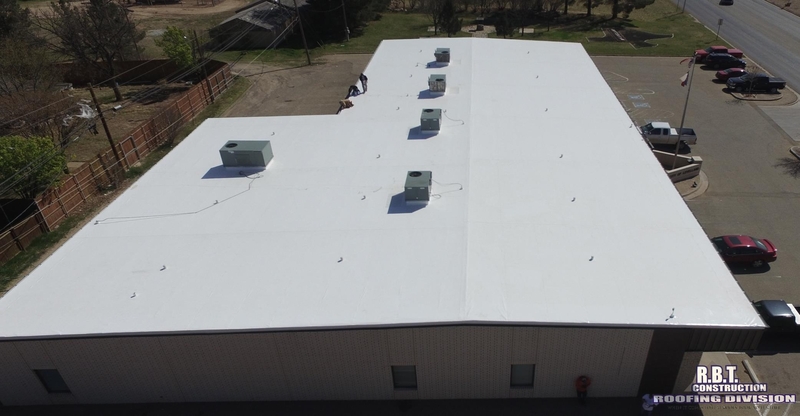 We handle all types of commercial roofs, including BUR, metal, and TPO, so you can count on us for a fast, reliable solution. We know that storms can cause serious damage to your property and bring your business to halt, so we work quickly to get your roof back in shape. From minor damage to full roof replacement, we do it all! Contact us today for more information about our repairs for a storm damage roof in Texarkana, TX. Contact R.B.T Construction Roofing Division Today! High winds can cause all sorts of problems for commercial roofs, and rain can quickly lead to leaks and structural damage. If you so much as suspect damage to your roof, contact our roofers for a comprehensive inspection. If you have an older roof, consider having it repaired or inspected before storm season hits to prevent any serious damage. When you need commercial storm damage roof repair in Texarkana, TX or the surrounding states, call R.B.T Construction Roofing Division at 903-691-0931! Updated on August 30, 2018 at 2:00 pm by R.B.T. Construction Roofing Division.